With Pullis Farm Cemetery and so much more. Nestled in the heart of Middle Village, Juniper Valley Park—which sits between Juniper Boulevards North and South, Lutheran Avenue and 71st Street on the west and Dry Harbor Road on the east—is almost intentionally situated far from the crowds and noise that the subway bring. 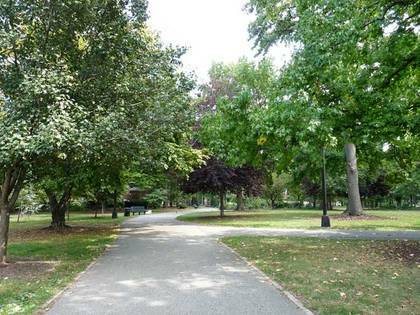 It’s one of the youngest of Queens’ larger parks, having been created in the 1930s. Middle Village lies between Maspeth and Forest Hills and was named in the 1830s after its position along Metropolitan Avenue, which was laid out as a toll road between Williamsburg and Jamaica in the 1810s. A roadhouse as well as several small dwellings and farms arrived in the area, which had come to be considered midway between Williamsburg and Jamaica, hence its name. Large cemeteries such as Lutheran/All-Faiths, Mt. Olivet and St. John’s arrived after 1850 or so, and attracted Sunday visitors; restaurants and saloons sprung up in the area to serve the crowds. In time, more streets were laid out and were lined by dwellings. Some of them, like Juniper Valley Road and Dry Harbor Road (said to be so named because the uninterrupted grassy fields in the wide valley, during its settlement in the early 19th Century, was said to resemble a waterless harbor) have been allowed to keep their original names and were not assigned numbers by Queens topographers. The park is named for Juniper Valley Swamp (misprinted on some old maps as "Jupiter") which, in turn, took its name from a preponderance of juniper trees; cedars were also frequent here in the early days. Before the park was founded in the 1930s, a race track and a garbage dump were located near the swamp, as well as a family cemetery that has, surprisingly, survived. The park got its start amid infamy. Much of it—nearly 100 acres—was the property of racketeer Arnold Rothstein (1882-1928). Among other criminal acts, Rothstein allegedly fixed the 1919 World Series in the Cincinnati Reds’ favor, with the cooperation of several Chicago White Sox, including their would-be future Hall of Famer, Shoeless Joe Jackson. To settle tax debts from Rothstein’s estate, the city purchased the boggy territory in 1932. Early proposals called for the land to be used for an airport or a new Queens civic center, but with the acquisition of adjacent properties in 1937 and 1945 the city created Juniper Valley Park. The city’s Works Progress Administration, formed during the Depression, built sidewalks and added park lighting, playgrounds, baseball fields, bocce, handball, and shuffleboard courts on top of what had been landfill. Hundreds of shade trees and flower bushes were planted at this time, and many of the trees date back to those original plantings. 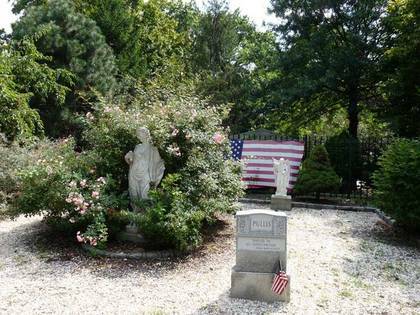 Thomas Pullis purchased 32 acres in Juniper Valley in 1822, and the Pullis family maintained a small cemetery in which family members were interred. 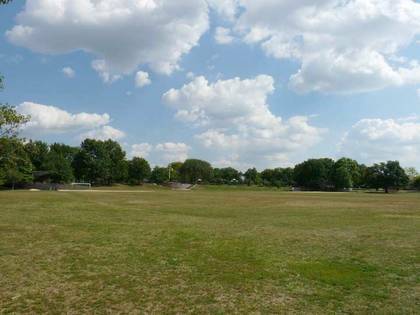 Pullis prohibited the sale of the cemetery in his will, and so the cemetery survived through the decades and Juniper Valley Park was constructed around its location, which evolved into Juniper Boulevard North and 81st Street. Unfortunately, like many small family cemeteries where interments have stopped and families moved away, it deteriorated significantly. By the 1980s, it was more or less in ruin. Pullis Farm Cemetery found an angel in Ed Shusterich, founder and president of the Pullis Farm Cemetery Historical Landmark and a Middle Village resident, who was able to raise enough funds to clean up the grounds, erect a fence, and install a memorial marker to replace lost tombstones. NYC Parks now maintains the ancient burial ground. Pullis Farm Cemetery is hardly unique in New York as far as being located within a park: Prospect Park surrounds a small cemetery maintained by the Society of Friends that contains the gravesite of famed actor Montgomery Clift, and Drake Park in Hunt’s Point in the Bronx contains a fenced-off cemetery containing the remains of the Hunt, Leggett, and Drake families. As I’ve said, subway access to Juniper Valley Park is not easy, but the Q47, which you can catch at the 74th Street station of the 7 train, runs past the park down 80th Street, as well as the Q29 from the 82nd Street 7 station. If you are in the mood to walk from the train, take the R or M to 63rd Drive and walk west. 63rd Drive becomes Penelope Avenue west of Woodhaven Boulevard, turn right on Dry Harbor Road one block, and you’re at the park’s southeast corner. —Kevin Walsh is webmaster of the award-winning Forgotten NY and the author of Forgotten New York and, with the Greater Astoria Historical Society, Forgotten Queens.